In the impersonal world of modern retail, Mainers find much to love at Renys. Can a Maine town survive if it loses its post office? The lighting of a monumental evergreen kicks off the holidays in Portland. Seasonal activities taking place across the state for the holidays. Our readers share their warmest memories of Christmas in Maine. Rockport photographer Joyce Tenneson draws inspiration from the sea. Why not treat a loved one to the biggest gift of all: The Pine Tree State. The tree-lighting ceremony is a magical moment for Portland, but it can be a logistical nightmare for Jeff Tarling, the city arborist. Tarling, entrusted with selecting the tree, transporting it, and erecting it in Monument Square, takes us through the precarious process, and explains why he’s done it for the past twenty-one years. I live in Maine but hate the outdoors. So sue me. Have you ever celebrated the holidays at this festive lobster trap tree? Portland International Jetport gets an expansive new look. A former editor of a Maine newspaper finds solace and struggles in building a new life in the woods. Paul J. Fournier knows the North Woods. He started his career as a Registered Maine Guide and a bush pilot, then went to work for the Department of Inland Fisheries and Wildlife, and later produced a television show Maine Fish and Wildlife. Now, he brings readers Tales From Misery Ridge (Islandport Press, Yarmouth, Maine; paperback; 195 pages; $16.95) in which he shares some of his most memorable tales gathered mostly from his decade-long experience living in Somerset County’s Misery Township. 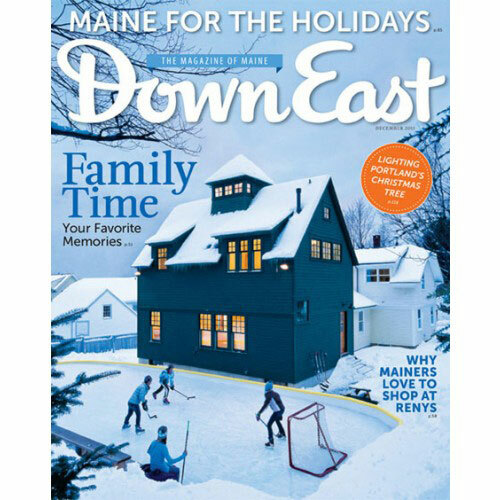 Maine lobstermen make trees from traps, a Bowdoin woman uses dogs to find missing pets, plus more. Working the telephone switchboard in Brooks was dangerous business more than a century ago. Amid the rolling hills, woodlands, and fields of rural North Waldoboro, David Swetnam and his wife, Jacqueline Sawyer, have turned a popular local fresh sauerkraut operation into a culinary destination for German food aficionados. Morse’s Kraut Haus Restaurant and European Deli draws fans from far beyond Maine who hunger not only for hard-to-find European specialty foods and authentic German fare, but also for the fresh sauerkraut that first earned German-immigrant farmer Virgil Morse fame back in 1918.